A bulb planter that is sharp, simple and darned near indestructible. Made to order, so please allow 1-2 weeks for us to make this tool for you. Bulb planters are not intended for coring holes in hard-packed, dried-out clay. You should till and amend a bed to a chocolate cake consistency and then use the bulb planter to cut nice round holes. Trouble is, most of us don't do that. We buy a light duty planter and use it to sink holes in dirt that's only slightly less hard than concrete. Then we cuss when the tool collapses in our hand or falls apart. So, here's a bulb planter that's made to hold up under severe abuse. 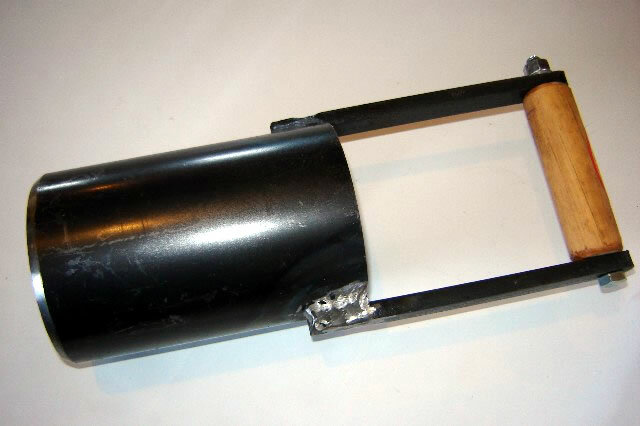 The one eighth-inch thick, tubular blade is sharp. (And should be kept sharp.) The handle brackets are forged out of 3/8x1/2" steel and the ash wood handle is extra thick. You should still prep the planting bed properly but if you don't, at least you won't destroy the tool or your hands. Diameter of the tube is 4 1/2 inches, outside. We also offer a smaller version of this bulb planter for $40. Call or email for details.